The two men are said to have been a lively contrast when they faced each other in court. To Burke's 'down-looking, sleasy look of a dog,' his useless nose, his round, unwrinkled cheeks, his short, thick frame inapt for any gait but a waddle, rose up in clear opposition the fantastic Hare. Hare was a 'spare wretch, grewsome and ghoulish'; he seemed much taller than his partner, all in lines, instead of ill-drawn curves; his face was hollow-ground to a point. Two grey eyes set so far apart that he had difficulty in focusing them, these set in obliquely, under two thick strokes of eyebrows, like a Tartar or a faun. This phantom has constant vivacity, he cannot stand still on his legs, but must be laughing or snapping. He frightened those who saw him when his history was known, but in his former days gave only the impression of a minus-habens, not quite an idiot but a 'mad Irishman'. If Burke was a dog, an ill-bred country mongrel that on sight any shepherd would shoot, Hare’s appearance had somewhat of the deviltry or the insane levity of the wolf. Hare's pre-history has even less substance than that of his inseparable partner. We know nothing of him, in fact, until he arrived in Scotland, to work on that same Union Canal, from Glasgow to Edinburgh, which was the humble Eldorado of so many of his wandering countrymen. He was of like age, race, breeding to Burke. 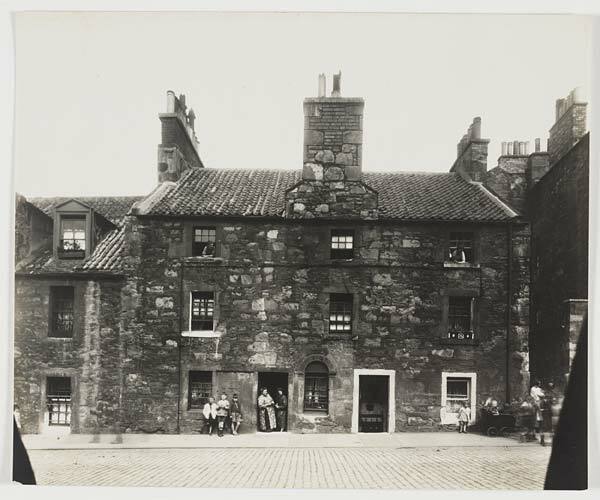 Probably Hare himself would have found it difficult to give a more detailed account of the years that brought him to Log's Boarding House, in the Tanner's Close, where Burke and his M'Dougal had entered as lodgers in 1826. For if the cardinal fault or failing of Burke is an ailing ambition, that characteristic of Hare is a lack of memory. In the mental life of most men there are no free thoughts, for each as it gets up is hooked by the foot in the piled accumulation of the past. 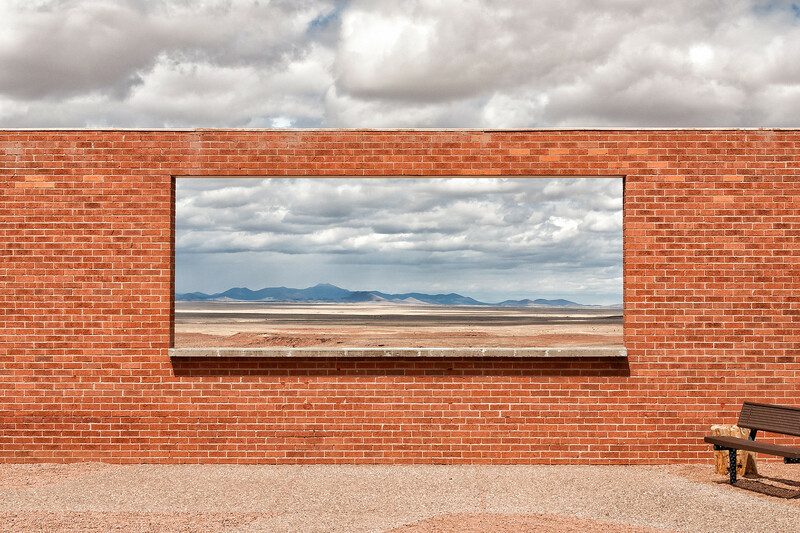 Memory, with the background of punishments, fatigues, partings, regrets, breaks our actions as it hampers our thoughts, and its weight produces the prevalent mood that we call character. On a man like Burke this incubus of the past was especially heavy. He lay always under a permanent weight he had been accumulating since his birth, of hungers, disappointments, frustrations once suffered. He was tongue-tied, and slow in direct consequence. With Hare, though the mechanism of recollection was little impaired -- he could remember details of the murders as well as or better than Burke -- yet the past had no hold on him. His actions were sudden and unrelated to such a degree that he found it easy to raise a laugh; his thoughts had the inferior originality of a child. He was ticklish and sudden in his passions, unrepentant and unmalicious, and this lightness compared with the seeming stupidity of Burke brought many into the error of considering him as the real leader of their joint enterprise. In court Hare laughed whenever his throat tickled, whenever a fly blundered in a pane, even while he was charging himself with nightmares of infamy; so that the judge himself turned pale with rage. The choice of the crowd for lynching would have been Hare, certainly an injustice. Among the street-orchestra that terrified poor Mansie in his loneliness was certainly, now and again, the coarse shout of Nell Burke, with her barrow of shoes to mend, trying to bring the highest attic dweller, student from Dalkeith, or consumptive Highland sempstress, to put their heads out through the string of washing and mark her in the dirty gutter below. Night and morning she would trundle and call, while her mate sat and hammered in a back room of the Log’s, in the artificial twilight, there occupied with the fascinating construction and furnishing of a cosmos, in the centre of which sat like a Buddha a crab-shaped little Irishman, hairy and muscular, meditating impassively on the mystery of lesser beings who whirled in a circle past him in his thoughts, like dust in an orbit round the sun. Street, lodgers, city, state had sunk in his mind, filled with the obsession of his own needs and plans, to a phantom of the lightest irreality. 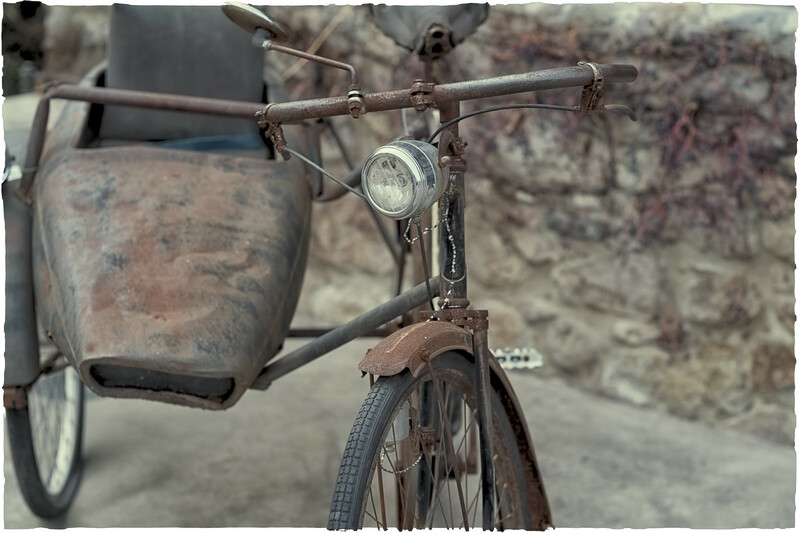 While Nell went out with the barrow, the Burke universe was in evolution. Tanner's Close was one of those narrow passages that trail, like ant-runs, from the north side of East Port. The place to which Burke had come for the completion of his destiny was a basement. 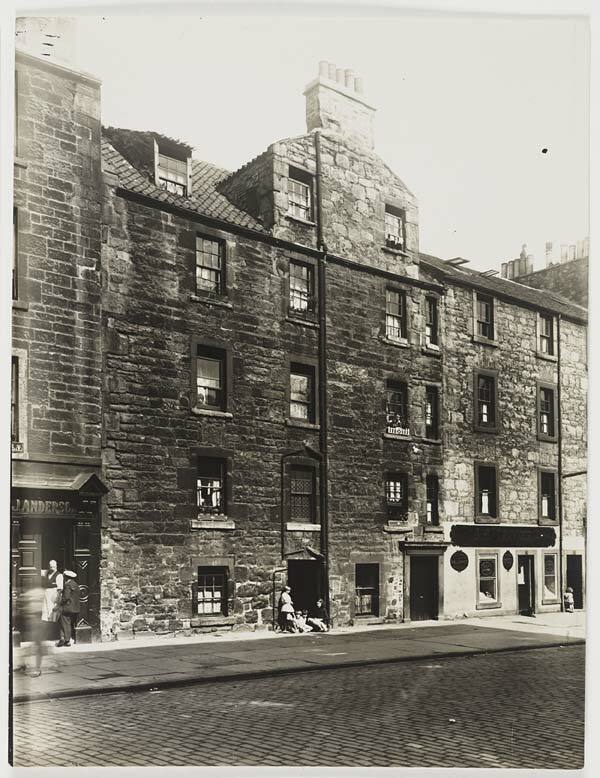 In Scottish technical language it was a self-contained flat of three apartments; in English, it had three rooms. The first and largest room, whose top-panes just peered above the level of the gutter, was crowded with beds, frameworks of unbarked pine-stumps, on which were laid grey sheets and earth-coloured blankets. These were at the service of any lodgers poor enough to need them. From this dormitory opened another furnished in the same manner. Farther inside was the cabinet of our cobbler, the reserved corner where the first of his crimes was committed. It was lit by a cobweb curtained window, overlooking a pigsty as far as a blank wall of the next 'land'. 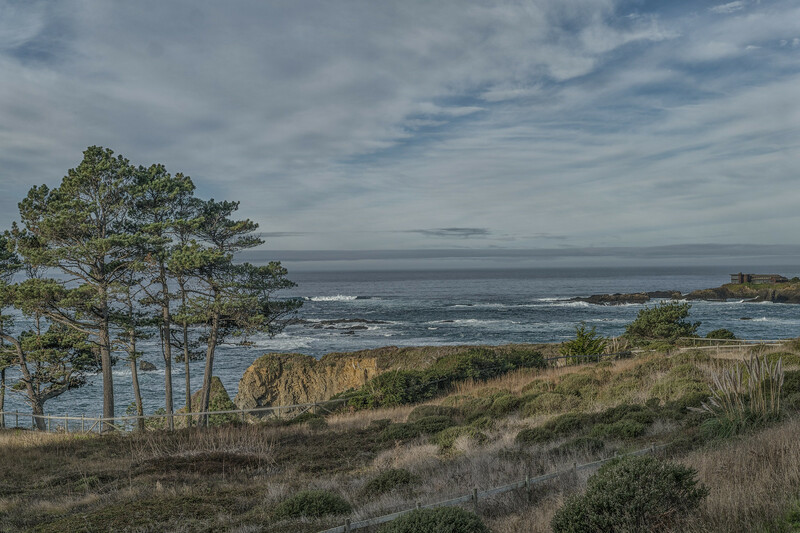 Sounds from the non-Burke periphery of the universe reached him muffled by the intervening rooms; from his room it was impossible for any sound to reach the street. Burke thus enjoyed a privacy perhaps unique in his life, for that is a luxury as rare for a labourer from mother's bed to common grave as any other privilege. In the inner rooms, in front of his makeshift last, the bench littered with geometrical cuttings of leather, the slouching box of nails, his hammer, the pungent messes of wax, tar, twine, blacking, his dusty reserves of cob-nails and tacks, Burke passed, like a novice in a cell, through his last period of free-will. Hitherto the events of his existence, though doubtless governed by indiscernible tides, had been apparently as indeterminate as the course of leaves in the wind. But in every life, by whatever zigzag it is come to, there is a collecting place from which the traveller is sent on henceforth in a line as rigid, as unavoidable, as the deduction from a Euclidean theorem. The back room at Log's was in Burke's life such a place, the entrance of a pipe into which once sucked in he was whirled inevitably on his fate and deeds, without any possible deviation. 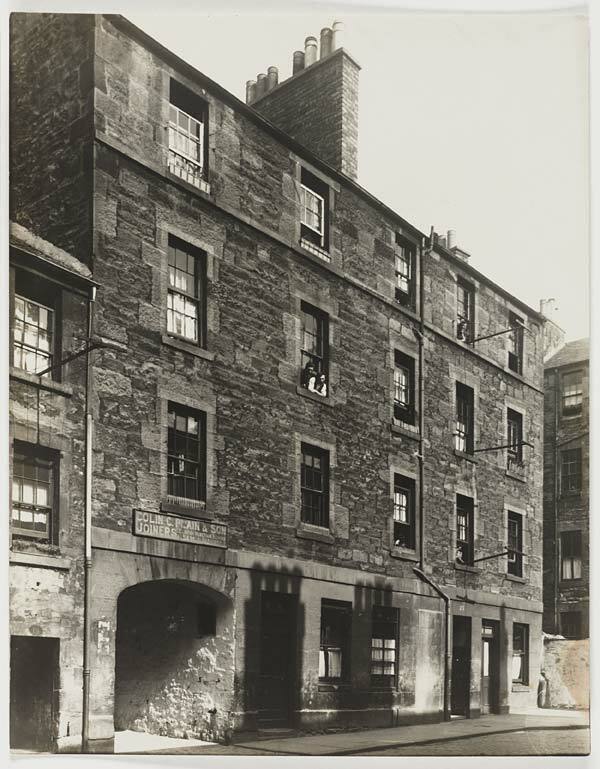 Photograph of a four storey tenement in Buccleuch St. Ground floor with sign 'Wee Beer Shop' and 'D. Cuthbert' over door, woman and two children at door, two men at window. 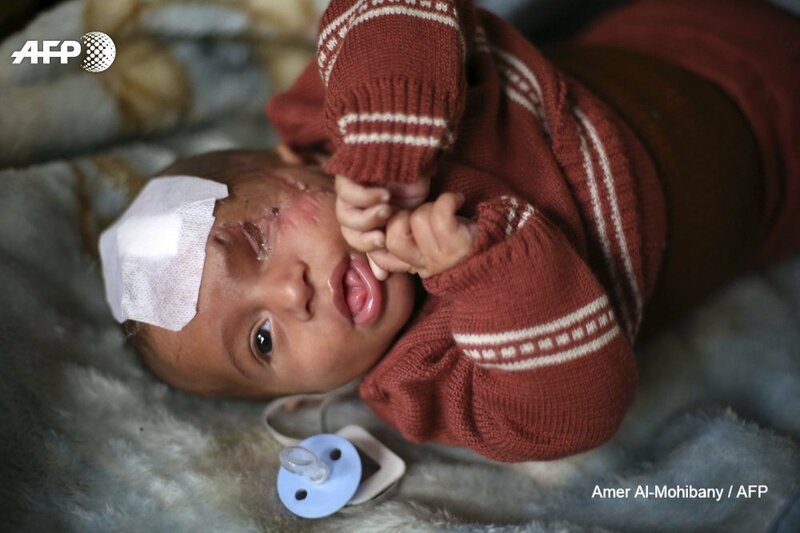 Little boy looking out of first floor window. Woman looking out of third floor window. Washing hanging out of third floor window. 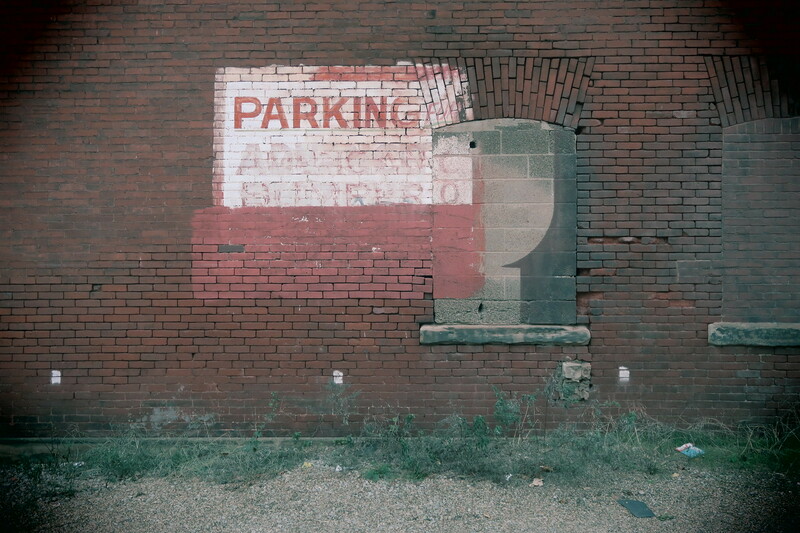 Advertisements on gable wall. 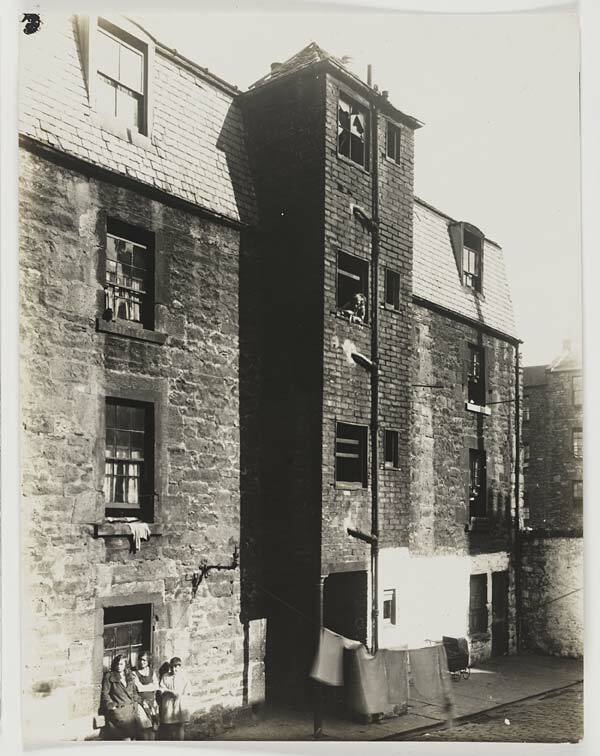 Photograph of a four storey Tenement in Oakfield Court, at the back of the building. The top storey window in the centre of the building is smashed. Below a child is looking out of second storey window at a group of three girls. In the foreground a line of washing is blowing about with a pram visible in the background. 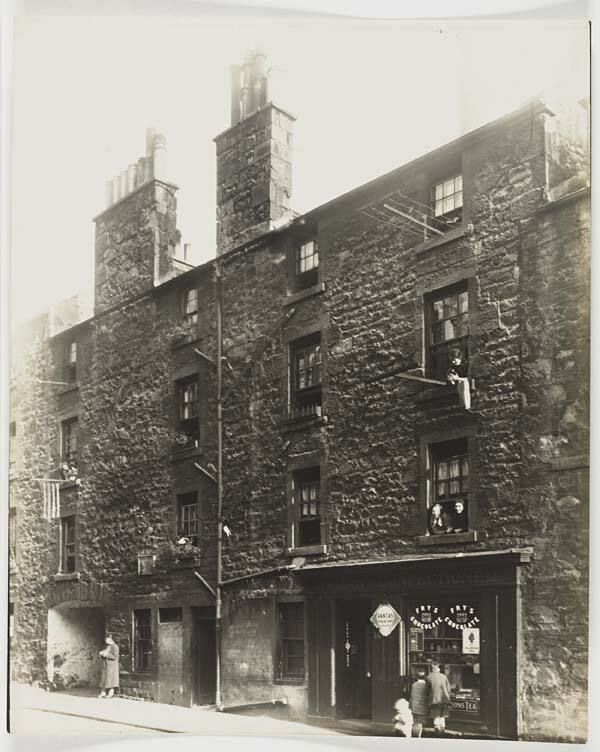 Photograph of a three storey tenement building with shops on the ground floor. The shop signs are M Bullon Kosher fish Restaurant and Cabinetmaker Joiner A.G. Heddle. On the left a bicycle has been propped against the wall and above a person looks out of a third floor window. To the right above the cabinetmaker a woman leans out of a second floor window. 9 Buccleuch Street 61B Ref. 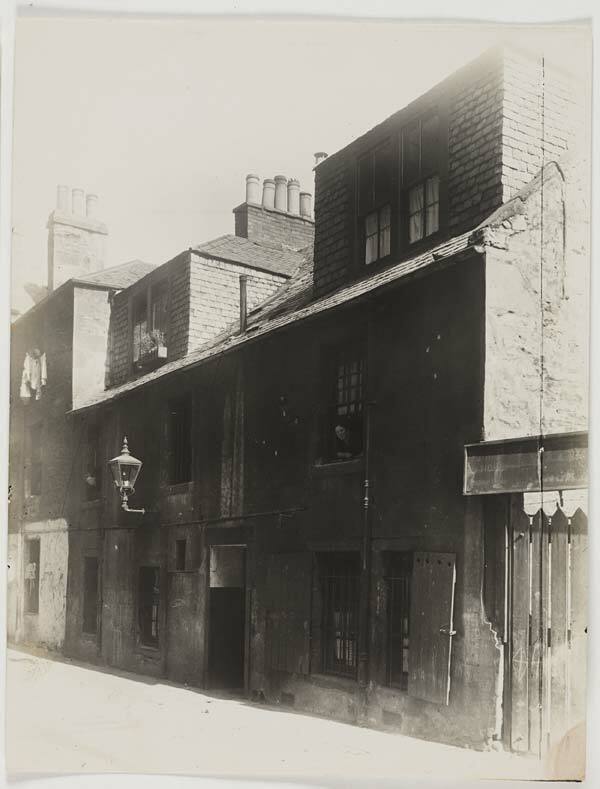 151 Area V.
Photograph of a two storey building with shutters and bars on the groundfloor windows. A lamp is on the left side of the building and there is a window box above. Two women are leaning out of different first storey windows and another is above in a second storey window visble over a line of washing. All of them are looking at the camera. On the far right a gate is visible at the end of the building. 12- 14 West Richmond Street. 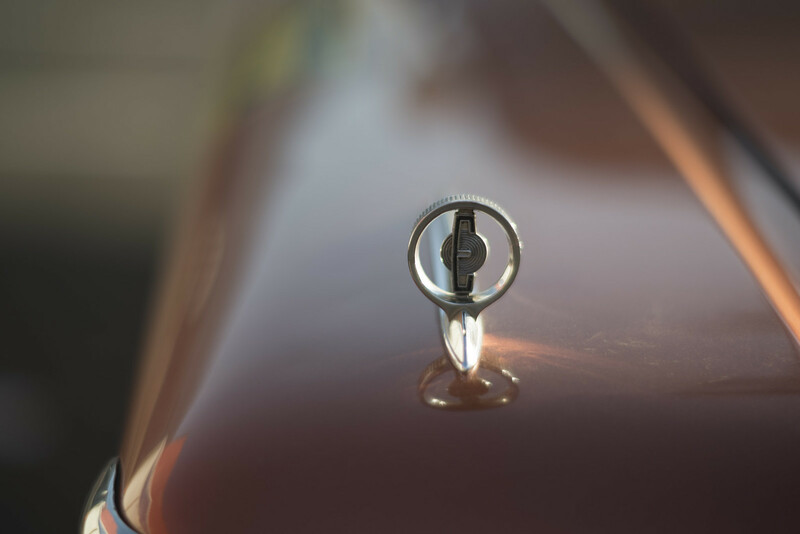 H. 86. 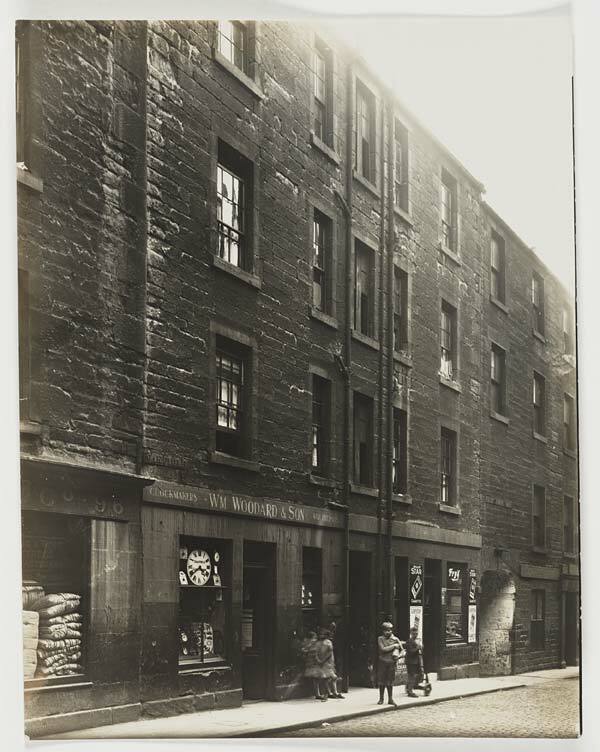 Photograph of a three storey building with two shops on the ground floor. 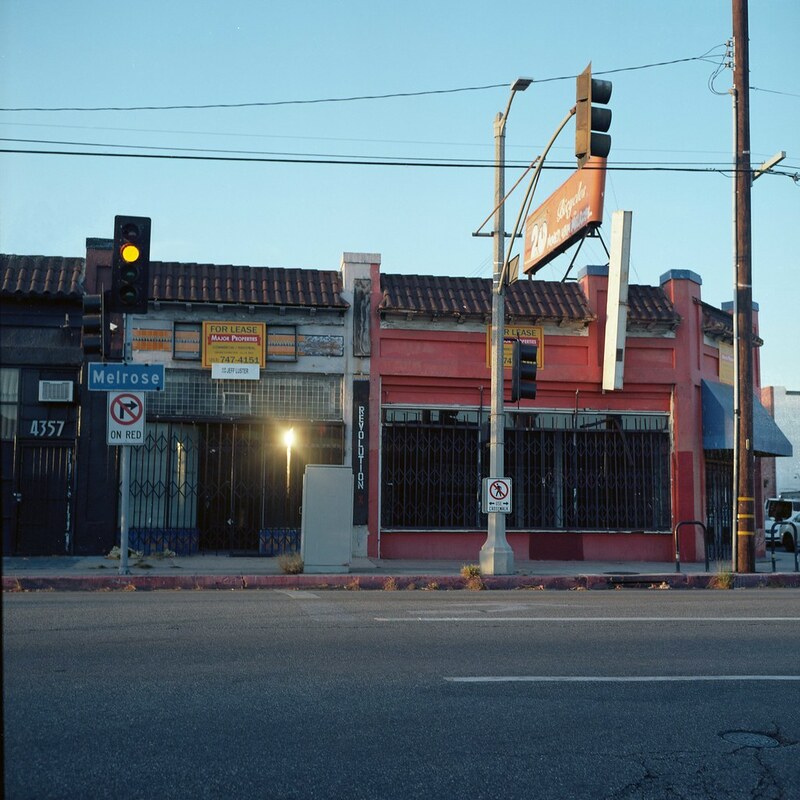 The two shops are J. Anderson and J.E.Trayner Wallpaper Paint. There are two men in the doorway of J. Anderson one wearing an apron. 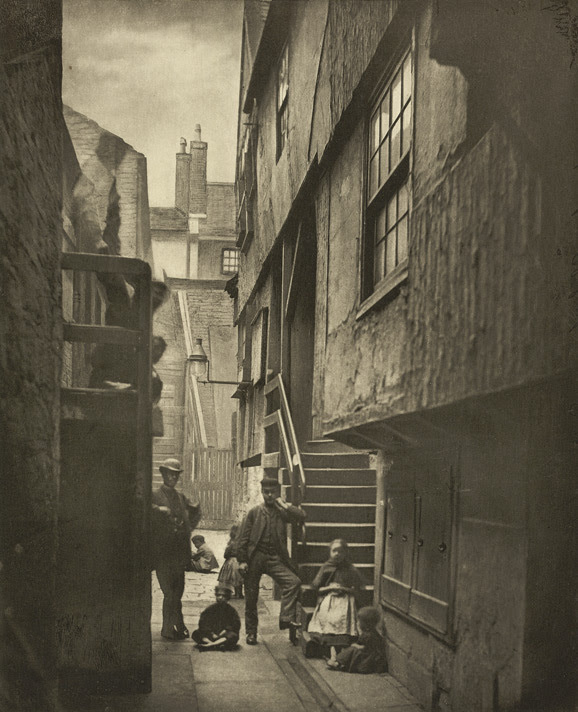 In a doorway in the centre of the picture there is a group of children, some seated. 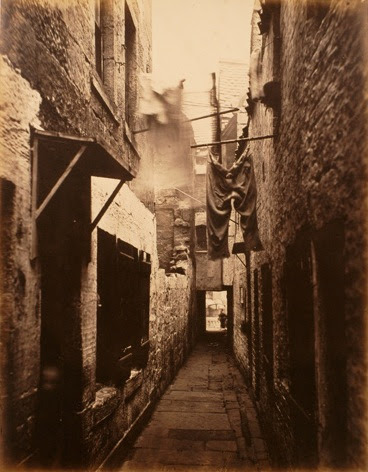 On the extreme right there is a small child leaning against the building looking away from the camera. There is also a dog outside J.E. Trayner. In the windows there are several window boxes and two people looking out. 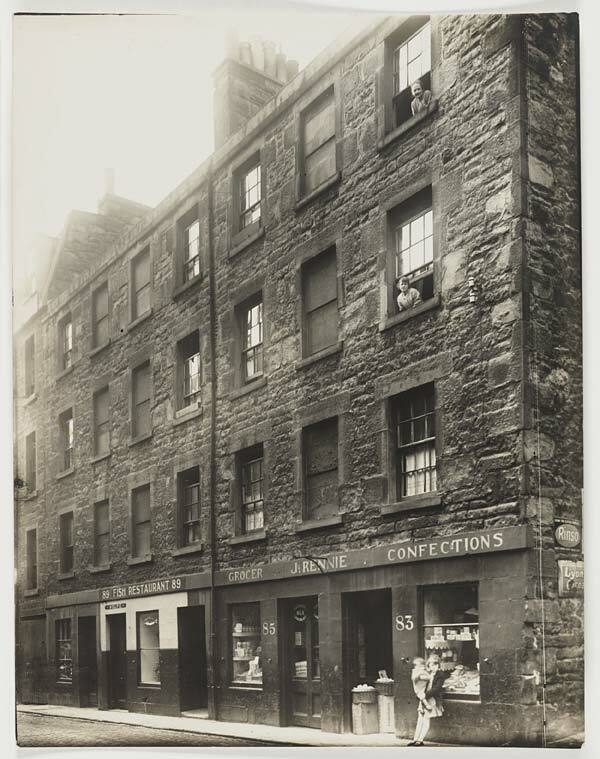 Photograph of a three storey building with people looking out of some of the windows. The shops on the ground floor are a fish and chips shop, a cold meat seller, and a boot polish merchant. A woman and child are talking in the doorway of the meat shop. Two women on the first and second floors are hanging a washing out. 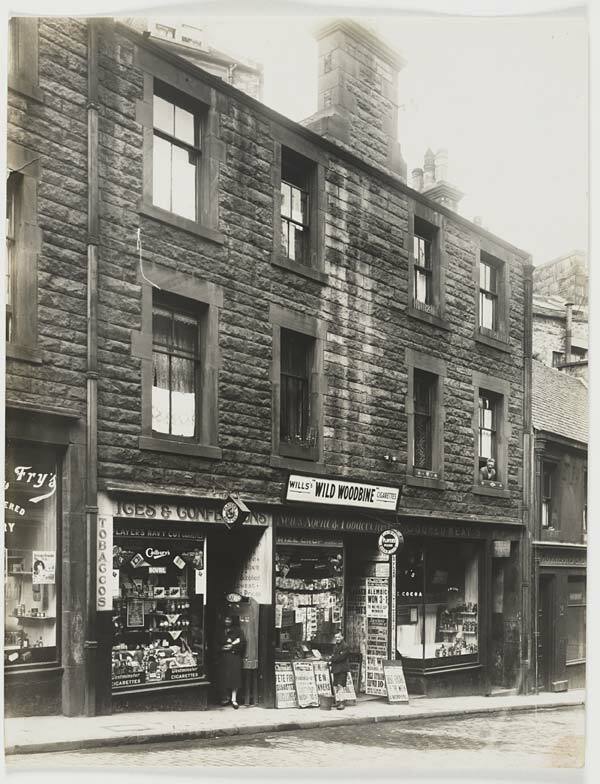 Photograph of a two storey house with shops on the ground floor: a tobacconist's on the left, a newsagent's in the middle and a shop selling cooked meats. The latter, however, has a display of small bottles in the shop window. In front of the newsagents a number of headlines are shown on billboards, and Woodbine cigarettes are advertised on a sign above the job. A woman is standing in the doorway of the tobacconist's, and a boy with a bucket is cleaning the shopwindow of the newsagent's. 14-18 East Richmond Street. F68. Photograph of a three storey building. There is a shop with an awning on the ground floor, a sign in the window reads 'Famous Pies'. Outside on the pavement in the centre there is a group of adults and children and a dog. Some of the women have baskets that they may be selling. There are also three people looking out of the windows above the street. 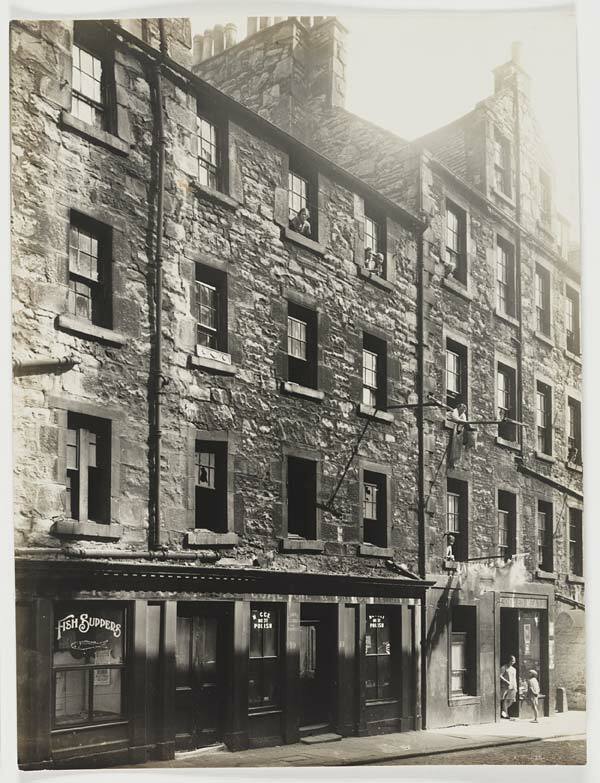 Photograph of a four storey tenement. Shops on the ground floor are General Dealer J.A.Masterson and Charles Greiner Wine and Spirit Merchant. Mother and child just visible in the fourth window of the top storey above the wine and spirit merchant. Below there are five men and two women standing around. There are also some people retreating under the archway on the left side of the picture. Photograph. There is a two stoery cottage style house in the centre with flowers on the window sills of the top floor and curtains in all four windows. Somebody is looking out of the top left window. The left door is open. An iron ladder leads from the roof to the chimney stack. 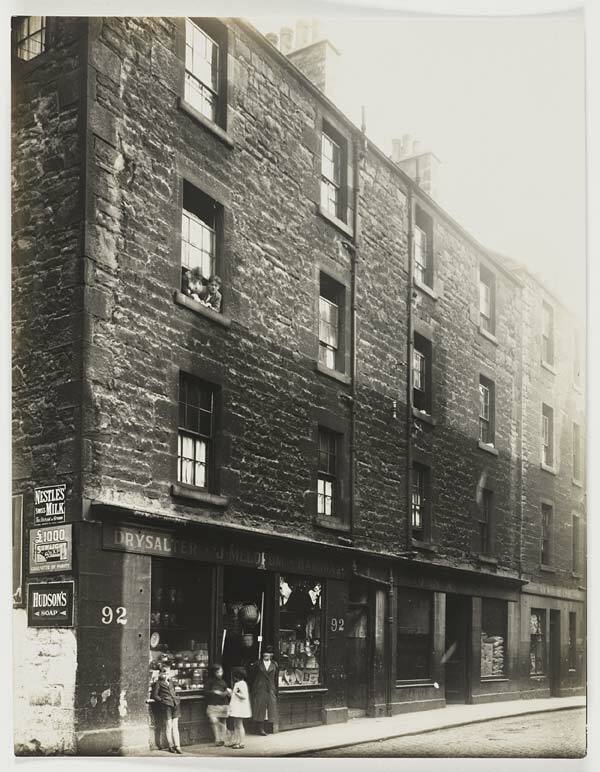 Photograph of a three storey buildings with some shops on the ground floor. A man is looking out of a second floor window. 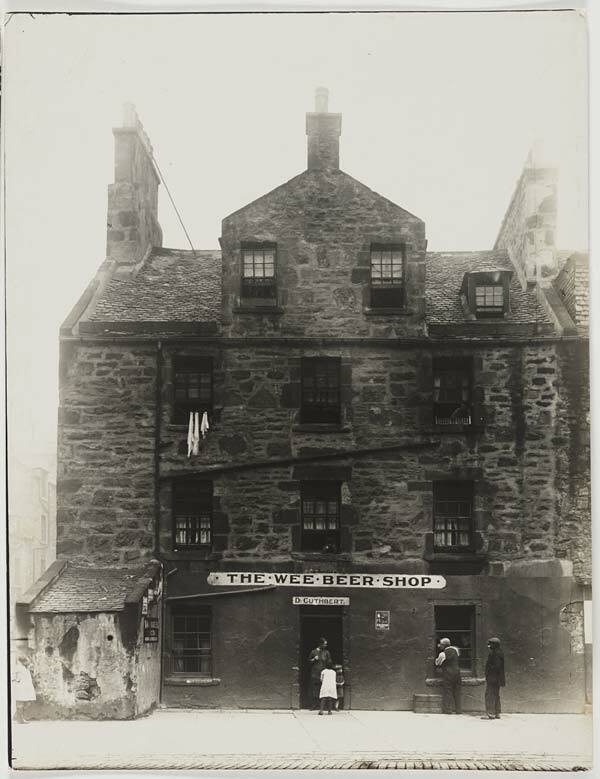 Photograph of a two storey building two women standing in the doorway and three boys in front. To the right, a women with children ans a pram can be seen. Two people are looking out of a window on the third floor. Photograph of a three storey building with a whitewashed gateway in the left leading to a joiner's workshop. 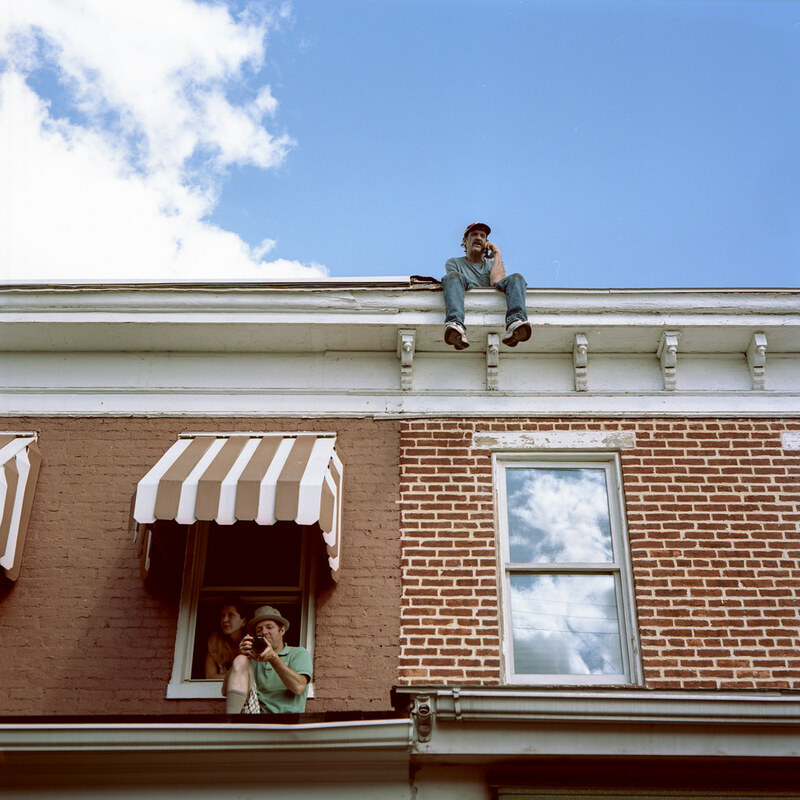 Two young people are looking out of a second floor window, and somebody is also at a third floor window. Photograph. 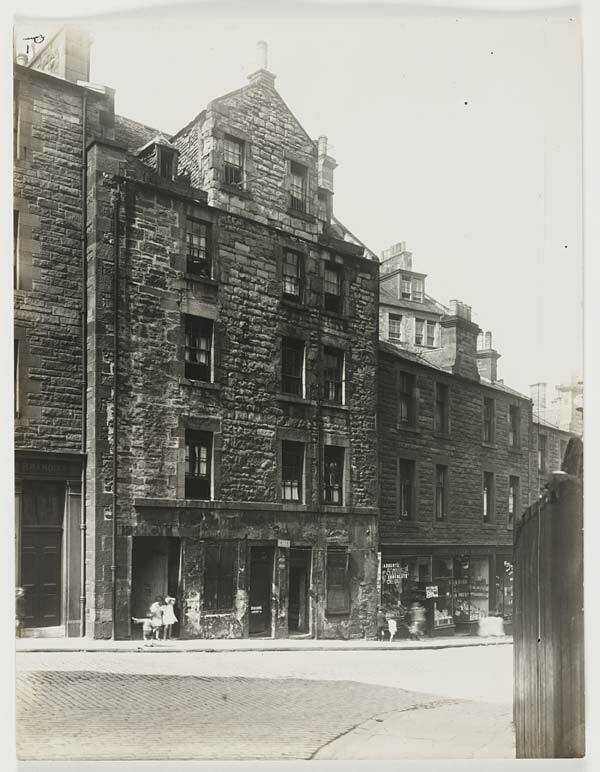 There is a three storey building on the left with 3 children standing in a close. A child is looking out of one of the top floor windows. Most windows have curtains. 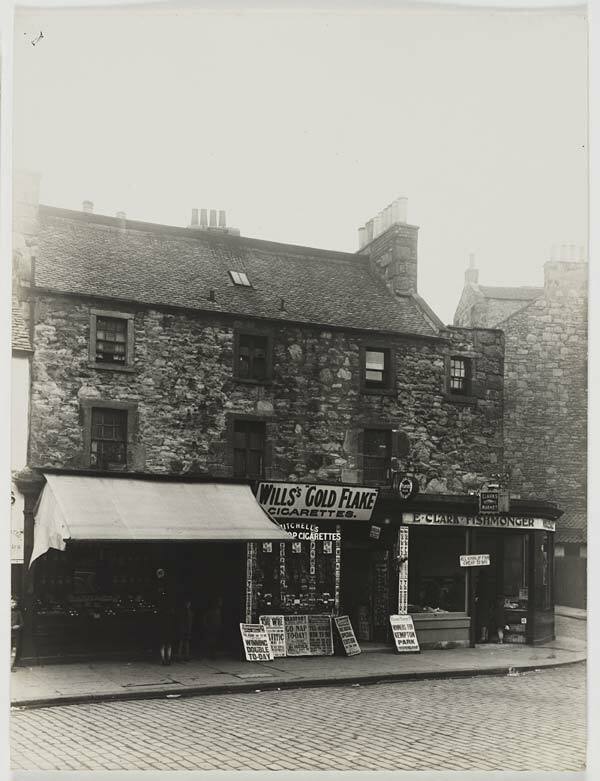 The two storey building on the right has a cash store for fruit, vegetables and sweets on the ground floor. Two boys are looking into the shop window. 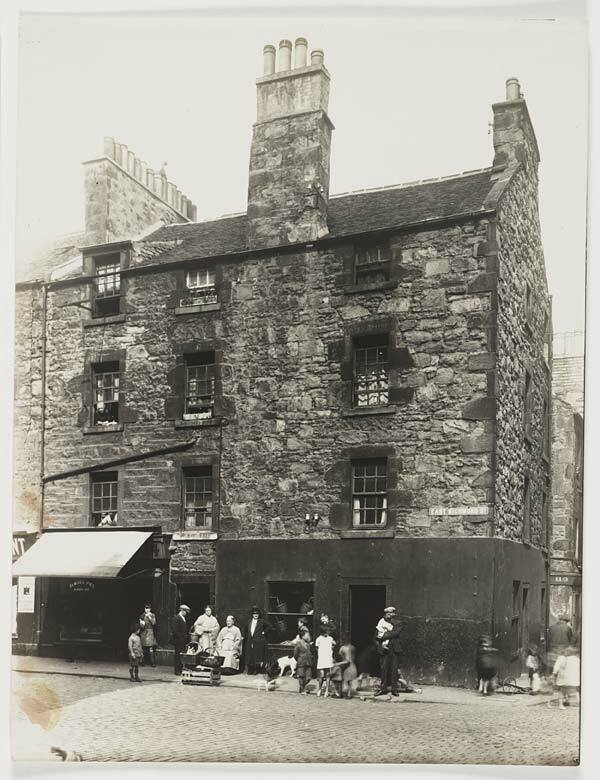 Photograph of a three storey building with people looking out of various windows. Two boys are inspecting the window display of a confectioner's shop on the right. A woman is standing next to a whitewashed gateway. There are flowers on some of the windowsills. 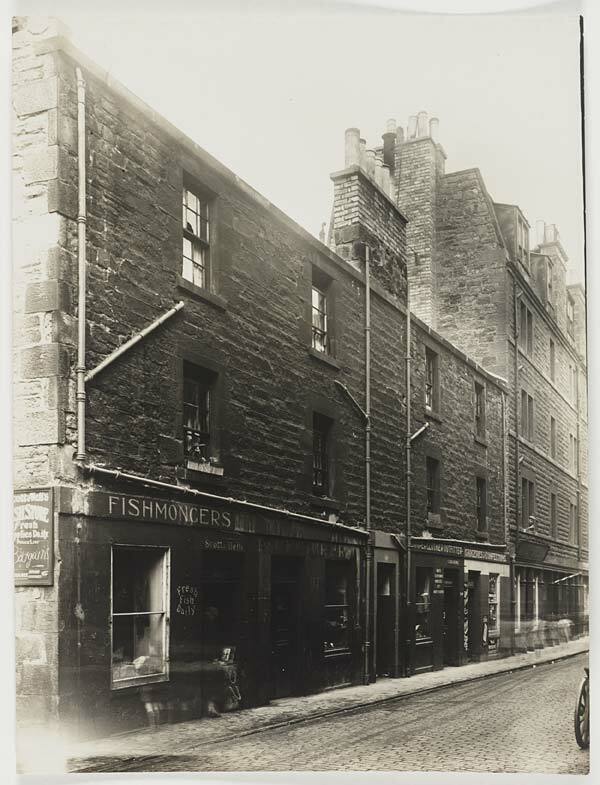 Photograph of a three storey buildings with a fish restaurant and a grocer's on the ground floor. People are looking out of a second and a third floor window, and a girl is standing in front of the grocer's holding a toddler. Fruit is displayed in baskets in the shop entrance. Photograph. 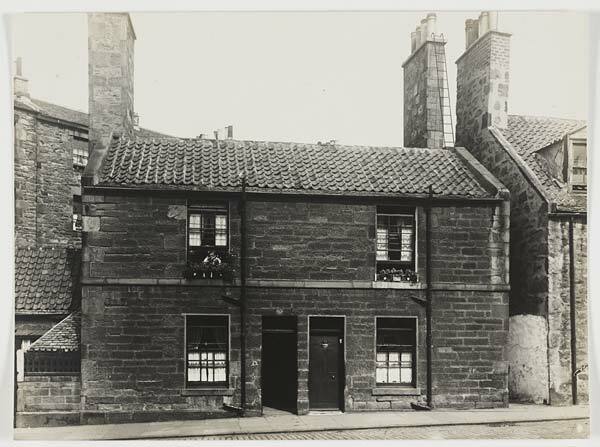 There is a two storey house with a turret possibly housing the staircase and a one storey building on its right. The front of the first floor of this smaller house is whitewashed. 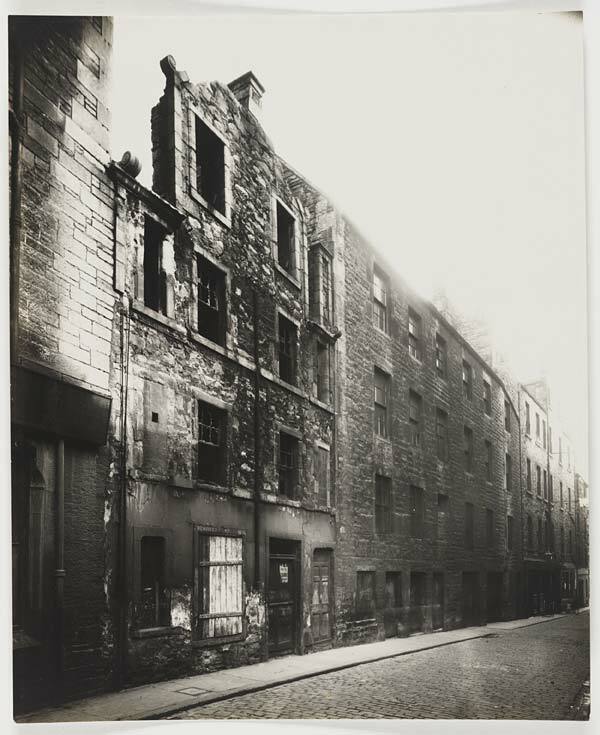 Photograph of a three storey derelict buildings, only the right one of which is still inhabited. Of the building on the left only the blackened façade is left standing, presumably after a house fire. The windows of the house next to it appear to be boarded up from the inside. 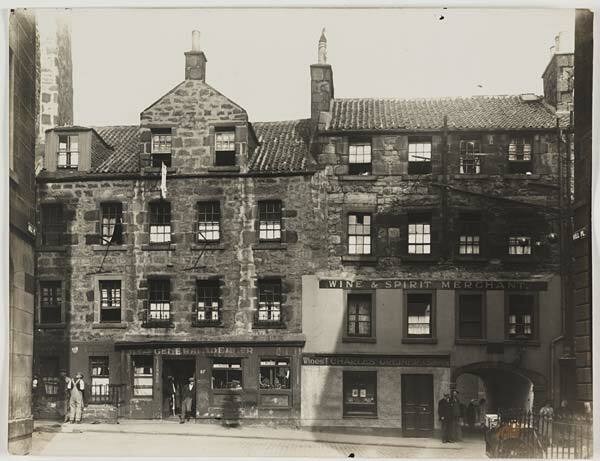 Photograph of a row of three storey buildings with shops on the ground floor. On the left, a hardware store has a display of crockery in the shop window and some baskets hanging in the doorway. A woman and three children are standing in front of the shop. 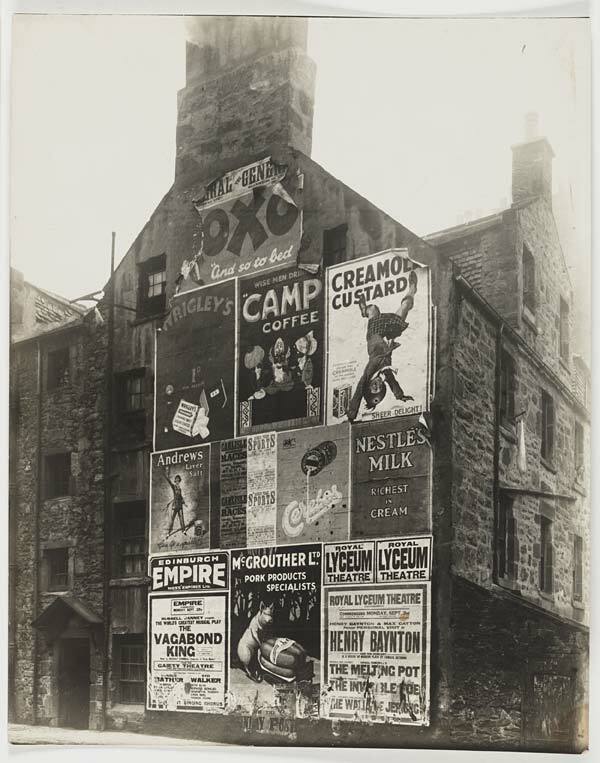 On the wall of the left house are advertisment signs for milk and soap. Two children are looking out of a second floor window. 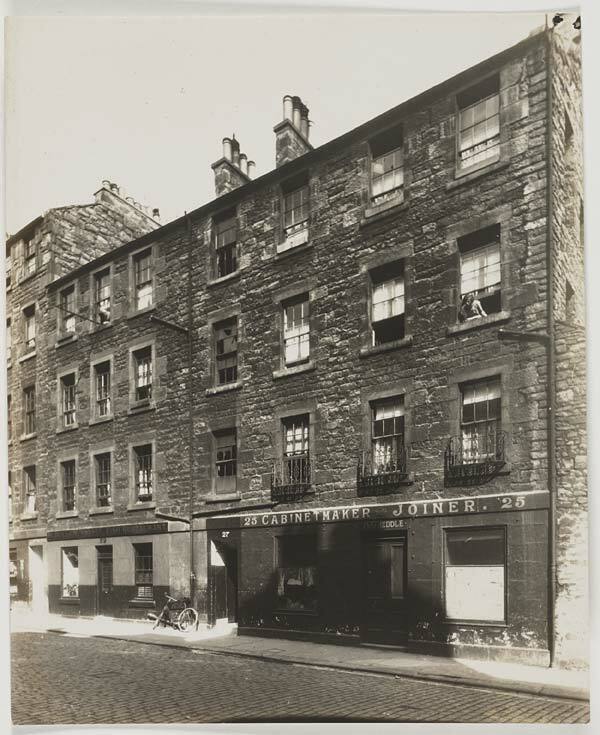 Photograph of a two storey tenement building with shops on the ground floor. 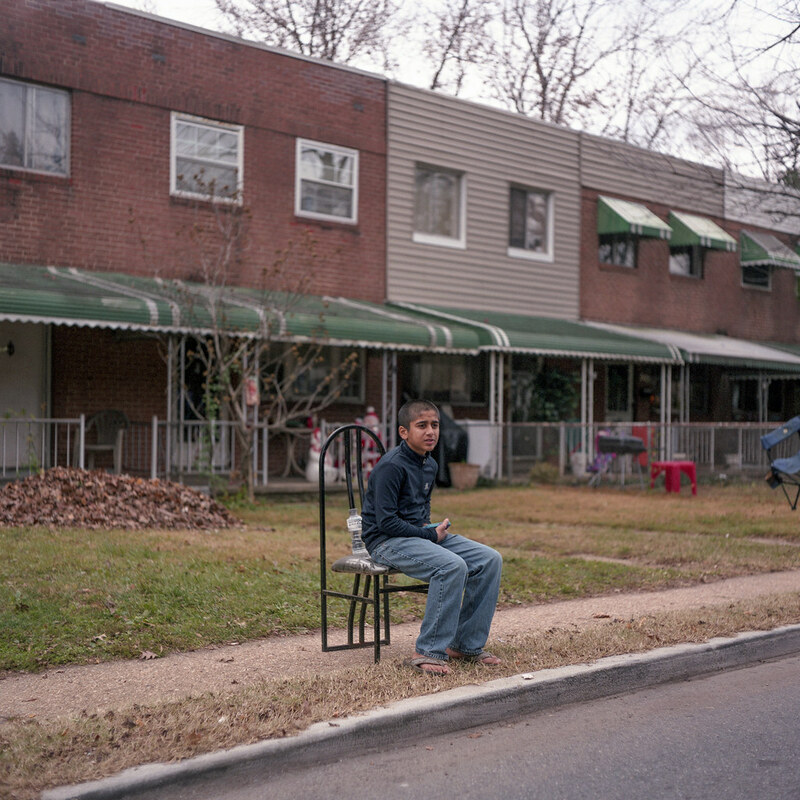 On the left a boy stands facing the camera. Underneath the awning for a shop three more boys are standing together. 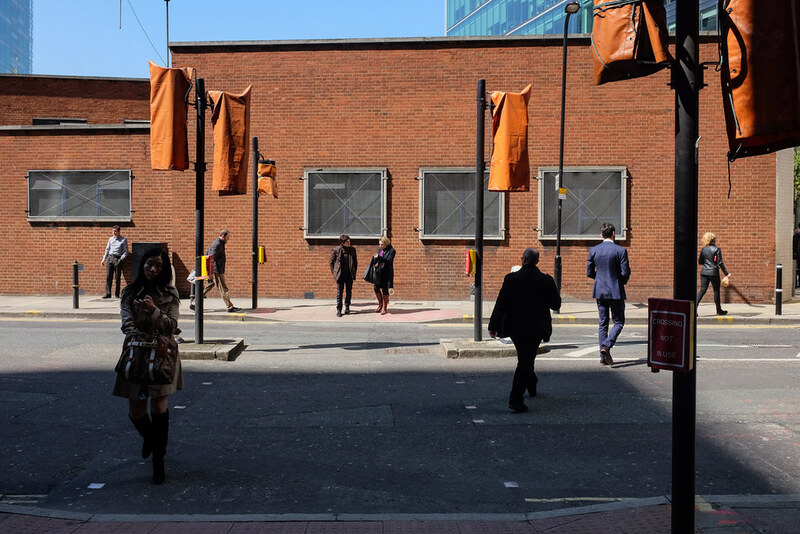 In the middle there is a tobacconist and newsagent which has its shop front covered in large advertisements for cigarettes and headline announcements for the daily racing papers. On the right there is a fishmonger's called E.Clark Fishmonger which has an extra sign in the window stating 'All kinds of fish cheap today'. In the doorway of the fishmongers some women have formed a queue, one holds the hand of a small child. Photograph. There are three storey buildings with a whitewashed archway on the right. The shop next to it sells groceries, and there is a clock-and watchmaker's store to the left of that. On the far left, pillows and mattresses are displayed in a shopwindow. There are two boys and two girls on the pavement. Gifford Park No. 2A – 2 Ref. 161. Area W., Edinburgh. 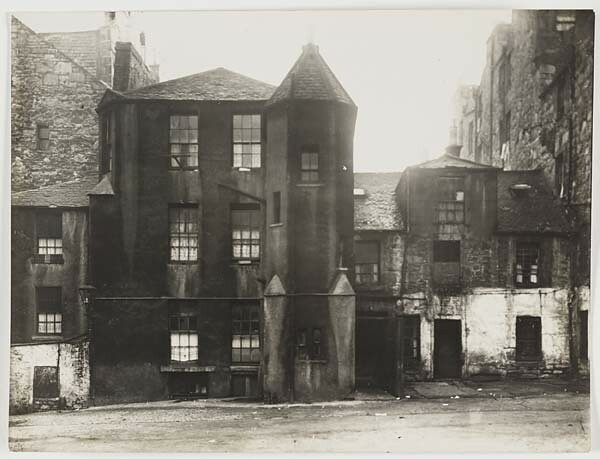 I have seen human degradation in some of its worst phases, both in England and abroad, but I can advisedly say, that I did not believe, until I visited the wynds of Glasgow, that so large an amount of filth, crime, misery, and disease existed in one spot in any civilised country. 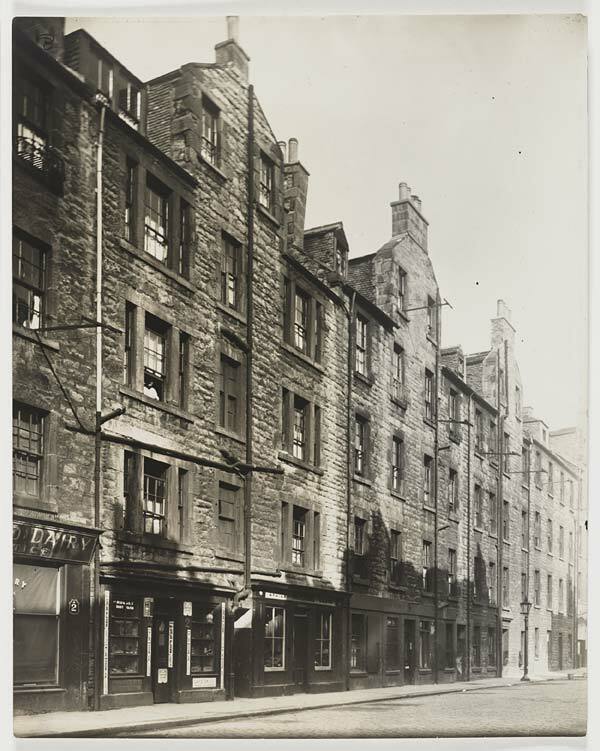 The wynds consist of long lanes, so narrow that a cart could with difficulty pass along them; out of these open the 'closes', which are courts about fifteen or twenty feet square, round which the houses, mostly three or four storeys high, are built; the centre of the court is the dunghill, which probably is the most lucrative part of the estate to the laird in most instances, and which it would consequently be esteemed an invasion of the rights of property to remove. In the lower lodging houses, ten, twelve, or sometimes twenty persons, of both sexes and all ages, sleep promiscuously on the floor in different degrees of nakedness. These places are generally, as regards dirt, damp, and decay, such as no person of common humanity would stable his horse in. "William Bolitho began writing his masterpiece, Murder for Profit, in the early 1920s, when he was still recovering from wounds suffered during World War I. Bolitho’s identity, fittingly enough, is a bit mysterious: consensus has it that he was British by way of South Africa, that he married under somewhat scandalous circumstances, and that he assumed the name of a famous banker and mine mogul to raise his social station (his real name is usually given as Charles or William Ryall). "[He] decided... to delve into the history of mercenary homicide with an eye towards writing a sort of poetic history of killing for money. His most famous assassins were Burke and Hare, the notorious body-snatchers who found a gruesomely profitable way to supply the demand of medical schools for fresh cadavers..."